Fred’s eyes trembled open in the dim light. He was alone. He stared at the small square lines of the cell, the locked door, and the graffiti on the walls, and felt a deep oppressive despair. As he sat up slowly on the narrow bed, his brain lurched painfully inside his skull, pulling inwards on his eyeballs. His throat felt like sandpaper, and there was a foul taste in his mouth. A wave of nausea washed over him and he belched, and sitting on the edge of the narrow bed with his elbows on his knees, massaging his aching neck, hunched over the faint odour of vomit which rose from his skin, he started to fire up his memory, searching it to discover how he came to be here. He was wearing a tracksuit that did not belong to him. He looked at his watch – twenty past seven. His sleep had been broken at least a dozen times during the night, a policeman rousing him briefly, then leaving him to sleep again. His memory of the day before was of sunshine. Margaret rushing around in the garden, the preparations for the charity garden opening, the glorious flowers – his flowers – and the smoothness of the lawns. Soft grass, light breezes, the chatter of voices, the chocolate sponges on the cake stall. It was something to do with Hunt. Fred was offered the opportunity to telephone his solicitor. The phone lay on the table between them. Fred looked at it and looked up at the policeman, wondering what to say. He picked up the receiver as though it was a rat that would bite him, and dialled Murrin’s number. It went to voicemail. ‘No it’s OK,’ Fred said. ‘You do not have to say anything. But it may harm your defence if you do not mention when questioned something which you later rely on in court. Anything you do say may be given in evidence.’ Fred looked down at the table avoiding the policeman’s gaze. Fred couldn’t remember anything, and said so. ‘Could you say that again please?’ asked the policeman. Fred said that he couldn’t remember, but he thought he had had a lot to drink. ‘Mrs Hunt stated that you had arrived at her house in a drunken state and there had been a fight between yourself and her husband. The spade, said to be yours, was stained with blood, and there was a large linear contusion on Mr Hunt’s head. We believe the fingerprints on the spade are yours.’ Fred turned his hands over, looking at the inkstains. He couldn’t even remember them fingerprinting him. I need a drink, he thought. Fred had worked hard in his garden, preparing for the charity opening. He enjoyed weeding, the physical connection with the soil, his fingers getting cracked and muddy. It had been a perfect afternoon in June, in Oxfordshire. The sunlight threw every blade of grass into fine focus, glinted off the backs of the ants running between the minute pebbles in the soil, and sharply outlined the thousands of fragrant creamy petals on the mock-orange. 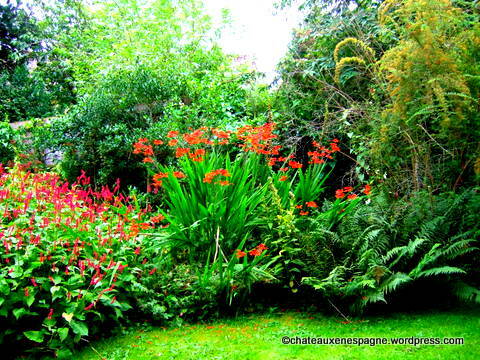 The lush borders overspilled with heavily perfumed blooms. Flowers of yellow, red, blue, pink, orange, mauve, with their many shades of foliage, luxuriated in the brilliant light. Bees droned through the hot and drowsy air and wood pigeons cooed in the trees. The lawns were soft and green enough to tempt bare feet. The flint-and-brick walls of the cottage were covered with climbing roses, velvety and dark red, with a rich, sweet scent that was the essence of a thousand perfect roses in each single bloom. Fred and Margaret had bought Woodlicote Cottage after their children had gone to University. Only eleven miles from their soulless dormitory town executive home, it had enchanted them with the idea of country living. They hoped to retire there if their pensions would allow it. The cottage nestled in an angle of woodland, and its acre of garden sloped down to a small orchard. There were greenhouses and an old potting shed of red brick. Down the valley, the view across to the Chilterns was only interrupted by the corrugated steel outbuildings of Hunt’s Farm. It had been hard to make friends in the village. Their land was bounded on two sides by woodland, Hunt was their only neighbour. His field adjoined their garden, and he also owned the land across the lane. Fred was still commuting to London, but Margaret did her best, joining the local Women’s Institute, the village hall committee, and the parish council. As Fred weeded, his thoughts had constantly returned to Hunt. The intoxicating sweetness of the garden turned bitter every time he stood up from his weeding to ease his back, and looked down the hill at the ugly outbuildings. The rancid smell of Hunt’s turkey sheds spread across his garden whenever the breeze lifted. As Fred stabbed the weeding knife into the ground, he thought how much he hated Hunt, with his multiple planning applications for the golf driving range, his turkey sheds, his muck heap. The arrogant way he looked at Margaret. Fred would have bought him out of the farm if he could have raised the money, and if there had been any chance of Hunt selling. But after Hunt had won the legal case over the turkey sheds, on appeal in the County Court, there could never be any agreement in that direction. At least none of the planning applications had succeeded, as yet. ‘What a beautiful evening!’ said Margaret, bringing a tray out from the cottage as Fred sank into a deckchair on the patio. Blackbirds sang in the hedgerow, and the sun sank lower in the cloudless sky, lighting up the scene with golden light. Hundreds of yards of lawn edging had been done, not a weed was in sight, and all the herbaceous plants were neatly labelled. ‘Pimm’s?’ she asked, lifting a crystal jug. Sapphire blue borage flowers, tinkling ice, and slices of lemon and cucumber floated in the amber liquid. Contemplating the prospect, Fred drained his glass, and held it out for a refill. Then the sound of a neglected engine and a stink of burning oil filled the air as a rusty Land Rover chugged up the drive. ‘And – it’s Hunt!’ said Fred, putting his glass down. ‘Great! I might’ve known that he’d show up to put the kibosh on the proceedings.’ They heard the front door being rapped aggressively. “I’ll go,’ said Margaret, colouring, and rising hastily. Fred followed close behind her as she opened the front door to their neighbour and his repulsive dog, which always seemed to have rolled in the filthiest corner of the farmyard. Hunt stood there in shorts and work boots, his tanned legs visible above rugby socks. His dirty t-shirt clung to the curves of his musculature and was dark with sweat. He had short blond hair and a ruddy, sharp-nosed face. ‘So, what exactly are you doing tomorrow?’ asked Fred. Hunt had tried every possible manoeuvre to get the parish council to award planning permission for the driving range, but had failed, it being felt that change of use to a driving range was not in keeping with the rural character of the area. This meant that the parish councillors did not want people from Reading crowding the area with their cars, taking up all the space in the local pub, and generally lowering the tone. Hunt had resubmitted the planning application in two or three different guises, and was relying on attrition to eventually bring him success. Fred had been one of the more vocal objectors to the driving range, and Hunt therefore took pleasure in annoying him by parking various irritations in the field, of which the muck heap was the most recent. “Could you not move it the next day?’ asked Margaret. Hunt shook his head obdurately. ‘It’s predicted to rain tomorrow night, so it’ll all go wet, see, and if I move it there’ll be spillage. You wouldn’t want spillage in the road outside your garden now, would you? You’ll just have to keep the parked cars out of the lane, I’m going to put cones down where I want it to be kept clear.’ With that, he strode back to his Land Rover, his dog jumping up into the passenger seat and sticking its head out of the window as he drove off. Fred’s teeth were clenched so tightly that he was unable to speak. It was morning. Someone was knocking on the front door. Fred woke up with a nasty taste in his mouth, feeling lightheaded and anxious. He had set the intruder alarm off at 3am, going downstairs for a whisky because he couldn’t sleep, and Margaret had not been impressed. The garden was going to open at 11, and with two hours to get ready, the people who were going to help started to arrive. ‘Hello-o!’ someone called up. Margaret opened the bedroom window and peered out. It was Mrs Carmichael, who had come early to set up the cake stall. ‘Hang on, I’ll be there in a sec!’ Margaret dressed hastily and ran downstairs as Fred groaned out of bed. He had just got himself into the bathroom when he heard Margaret yelling and went to see why. As he walked round the side of the house, a deep, sick feeling gathered in his stomach. The garden was in chaos. There were six black-and-white cows eating the long grass in the orchard. Clearly the roses and most of the herbaceous plants were not to their liking, but unfortunately quite a lot of the flowers had been trampled. The plants in their pots that were for the plant stall had been knocked over and some of them had been eaten. ‘Hunt!’ said Fred, cursing. ‘He just had to try and wreck everything, didn’t he? I’m going to ring him and make him come and sort this out.’ But Hunt was not answering his phone. Fred and Margaret and Mrs Carmichael drove the cows back through the gap in the hedge, which had appeared overnight. ‘It might still be salvageable,’ said Fred, but he was shaking with anger. He opened up the potting shed and got out a shovel and a wheelbarrow, and set about cleaning up the cowpats, while Margaret phoned the committee to sort out parking at the village hall. With a couple of swigs from his whisky bottle in the potting shed, he started to feel calmer. He closed the hedge with wire and did what he could in the herbaceous border, removing obviously broken parts of the plants and staking out the others. Mrs Carmichael and a couple of other ladies from the WI helped to put up the trestles for the cake and plant stall, locating them carefully over the more trampled areas of the lawn. Fortunately, quite a few plants which were being donated by neighbours were yet to arrive. At 11, the first visitors began to arrive, a few at first, and then by noon there were 40 or 50 people. The garden was definitely not looking its best, but it was a beautiful hot day, and people were happy to pay for their admission on a goodwill basis knowing that the money would go for charity, some perhaps making more of an effort to contribute to the cake and plant sales than they would normally have done. Fred cooled off with a bottle of cava in the kitchen, and Margaret, busy at the cake stall, started to relax. ‘You just have to laugh about it really,’ said Fred, forcing a lopsided grin. All that hot afternoon, Hunt turned the muck heap over with a mini excavator, emerging from the field every so often with a stinking load and driving it slowly down the lane. Every time he drove past Fred stared at the vehicle with a hard face. That night Fred ate his supper morosely, chewing down on the food as though sinking his teeth into Hunt’s flesh. Margaret ventured a couple of topics of conversation but he said little. His face darkened as he drank three quarters of a bottle of red wine, the tumult in his brain subsiding to a quiet sullenness as the alcohol relaxed his body. After the plates were cleared, he said he was going into the garden. Dusk was falling as he opened the potting shed. He pulled out the whisky from behind the garden chemicals. Swigging from it, he leaned against the door jamb, facing the trampled lawn, the herbaceous plants laid low, and the awful smell of the manure. The whisky level fell in the bottle and his heart thudded in his chest as the alcohol drove away reason. He cursed and swore, his invective heard only by the rooks settling in the wood behind him. The turkey sheds were the absolute limit. He could not tolerate the situation any longer. He decided to have it out with Hunt. He took a spade from the tool rack, leaning on it like a walking stick as he lurched his way to Hunt’s Farm. Hunt’s dogs were barking madly when he knocked, but he heard Mrs Hunt shooing them inside before she opened the door. She was still wearing her washing up gloves. She had short brown hair and an expression of permanent unhappiness. Her eyes were red, and across one cheek were three parallel bruises. ‘Get your husband,’ slurred Fred. ‘I want a word with him.’ She turned round and called out, and Hunt came lumbering to the front door. After an exchange of words, Hunt stepped out on to the doorstep shouting. Fred lifted the spade up to stop him, Hunt angrily grabbed it and twisted it away. Then there was a struggle. Hunt had him by the throat squeezing. Fred dropped the spade, and with a desperate effort tore Hunt’s hands away and staggered away across the muddy yard. Then Hunt had him again and Fred started to sink to his knees with Hunt on his back, his vision greying out, the pain in his throat excruciating despite his drunken state. ‘Stop it Gary! You’ll kill him!’ yelled Mrs Hunt. Fred’s lungs screamed out for air, his heartbeat drummed in his ears like a pneumatic drill, and the barking of the dogs and the voices around him faded out. He heard a soft thud, like the noise the spade made when driven hard into new ground, and felt his throat relax as he drifted under. After the ambulance had taken Hunt to hospital, and the dogs had run around in the yard, there was little left at the crime scene for the police to see. Fred dug two spades deep into the rich dark earth, forking in manure all along the trench, and then filling it in. This year, he was going to grow runner beans, potatoes and beetroot. The polytunnel would yield a good crop of tomatoes, as well as all the bedding plants he had grown for the prison flower beds. ‘No worries about retirement, then,’ he thought to himself. Very well written. I love the descriptive passages. I couldn’t resist reading this before the deadline, since I enjoyed your previous story so much. I love your deliciously detailed descriptions and I felt your story was a very realistic portrayal of intoxication and of the character of Fred. You made a tame garden-opening so sinister, which I feel captured the essence of what a moment of intoxication might be like in reality–in that a normal, average Joe could be capable of any act of crime. Scary thought. Very dark and thought-provoking! hey- very cool- my other half is from Reading and she has deffinatly brought down the tone of our village!! Well done giselle, another well-crafted story – very authentic! Was able to picture the surly farmer and his dung…. Good ol Fred! I could actually smell the muck heap! Excellently written in a style which draws the reader along. And well done Mrs Hunt!